Received this week from the Parts and Customer Service Representative for the CZ-USA Webstore. Unfortunately we received word a couple of months back that the factory is no longer supporting the CZ 82/83 and what we have left in stock now in the webstore is the last of the parts we’ll be receiving. I am not real surprised, the 83's have been mostly discontinued for almost 6 years aside from the small run two years ago. We have been lucky to have parts support for even this long especially for such a niche model that was never a huge seller in the US. I stocked up on parts years ago when I started getting into collecting 83's so I should have enough to keep mine running for a very long time. I feel slightly less insane for the couple hundred dollars of 83 parts I've invested in now that there won't be any more. I mostly only shoot the .32's which should not put much stress on the components of the gun anyway. Most concerning though is the sear spring - those appear to be out of stock already and that is the part most often damaged during reassembly from a complete detail strip. I am not aware of anywhere else to source the sear springs. Appreciate the info...might have to buy a "shooter" grade 83 for spares!! Thanks. Snagged the last two sear springs and an assortment of springs and parts from the main CZUB store just now. They are not expecting any restock. 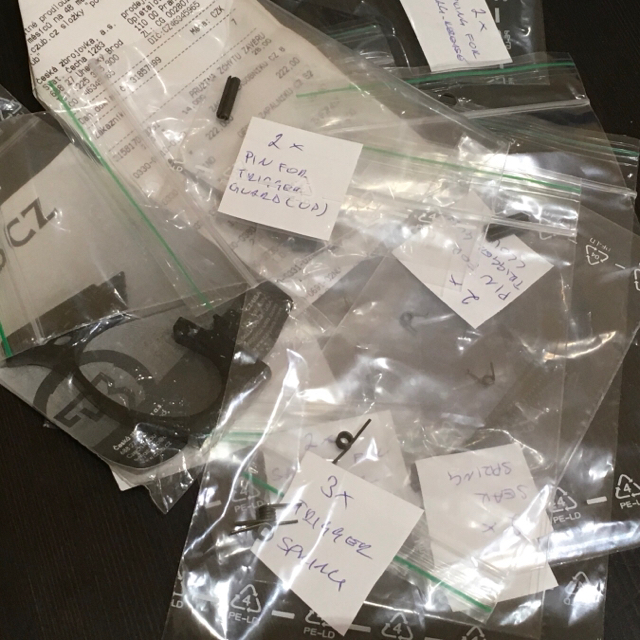 Went through the parts drawer and we put less identifiable springs and pins with labels in baggies for future reference. If they had any sense, they'd give you a job there ! !